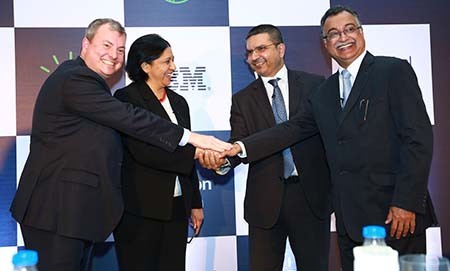 Manipal Hospitals' corporate and teaching facilities in Bangalore, India, will be rolling out Watson for Oncology from IBM. Watson for Oncology is a cognitive computing platform trained by Memorial Sloan-Kettering. It analyzes data to identify evidence-based treatment options, making it possible to provide individualized care for patients with cancer. More than 200,000 people receive cancer care at Manipal facilities each year. The deployment of Watson is the first in India and the first of its kind as the country advances efforts to transform healthcare, IBM executives said. Watson represents a fundamental shift in the paradigm of computing – moving from programmable systems which have been the mainstay for the last several decades to learning systems that keep getting smarter as they process more knowledge. To date, Watson for Oncology has absorbed nearly 15 million pages of medical content, including more than 200 medical textbooks and 300 medical journals. Using natural language, clinicians using Watson for Oncology will be able to explore treatment options, analyze information provided, and gather evidence specific to a patients' individual health needs. Watson's machine learning capability means it is continuously learning about oncology over time, and doctors have access to peer reviewed studies, clinical guidelines, and expert perspectives. Cancer of all types claims approximately 680,000 lives each year in India, making it the second leading cause of death in the country after heart diseases , according to the World Health Organization, International Agency for Research on Cancer. There are 1 million new cancer cases diagnosed every year in India, and this is expected to rise five-fold by 2020 India faces an acute shortage of oncologists, surgical oncologists and radiation therapists. Also, doctors face an increasing battle to stay up to date about best practices in treatment and care management. "We are at an inflection point in India regarding cancer care, driven by the increasing number of cancer patients, fewer oncologists to treat them and the broad geographic footprint of our region, Ajay Bakshi, managing director and CEO of Manipal Hospitals, said in a press statement. Rapid advances in personalized medicine, and an ever-growing amount and diversity of clinical evidence, amplify the situation, he added. "With IBM's Watson for Oncology, we can combine our clinicians' expertise across various types of cancers with a cognitive computing solution informed by expert training from Memorial Sloan Kettering Cancer Center.